Back in March 2012 Play and Leisure were invited, by Rotherham MBC, to provide a price for several pieces of our play equipment that a rural Parish Council were interested in. This Parish Council had wanted to improve their local play facility for some time and after extensive consultation two of Play and Leisure’s products were chosen. The Parish Council in question was Thorpe Salvin and the play area was The Sorby Memorial Field Recreation Ground. Funding was obtained after lengthy work from members of the Parish Council and an order was finally placed in April 2013. 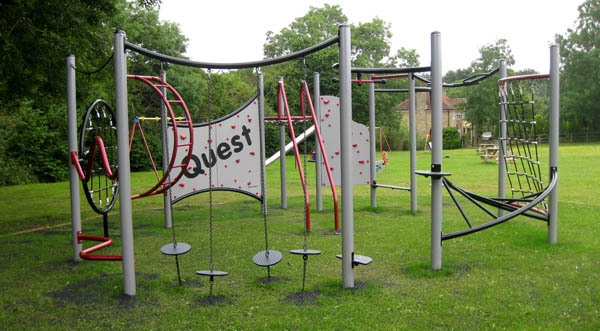 Work Commenced in June to install a Quest Cosmos, a large activity unit in the shape of a circle and a Cantilever Basket Swing, both were to have grass mat impact absorbing surfacing. After two weeks, much to the delight of the local children the equipment was ready and a picnic in the park was arranged for the following Sunday afternoon.